In order to manage the group dynamic effectively and help steer the healthy development of positive mentoring relationships, it is helpful to have an understanding of the stages and features of relationship development. With regard to group mentoring, there are two bodies of knowledge that can be explored for information on the development of relationships and groups: Group Development Models and Stages of a Mentoring Relationship. Highlighted below are two models that you may see play out in your girls group mentoring experience. Forming: As groups come together, there is the initial, formal and sometimes awkward or uncomfortable stage as participants meet and get to know each other, come to understand what the group is for and how they will work together. Storming: As participants start to interact, and seek out their place or role in the group, conflicts can start to emerge. This is a natural part of any group process. Norming: As groups continue to work together, ways of operating and norms of expected behaviour begin to be clarified and people assume relevant roles. Acceptance of the process and each other grows. Performing: With time, experience and intention to their purpose, groups enhance their effectiveness in accomplishing the task that has drawn them together. Adjourning: Groups end either by concluding or evolving into something new (i.e. the purpose changes or members transition on to something else). This time of adjourning can also be vulnerable or uncomfortable for some. Program staff and mentors should be aware of these stages, and have ideas, tools and processes to help the group successfully transition from one stage to another. As each group will be different, there is no step-by-step formula; groups may need to try different things to see what works for their program as well as their specific group of participants. In girls group mentoring programs, Tuckman’s Theory can be an important component of staff and mentor training. For more in-depth information about Tuckman’s Theory, what to expect in each of these stages, as well as tips for applying this framework to your program, see Tuckman’s Theory of Group Development in the Additional Resources for this section. In this initial stage, mentors must be consistent, reliable and follow through on their commitments, as the youth are deciding whether or not the mentor can be trusted. It’s very important to be patient; in some relationships, this stage lasts a few weeks, and in others, it could last several months. Consider the population of girls you are working with during this phase of relationship development. Girls facing multiple barriers may take longer to develop these early connections. As with the first stage of relationship development, it’s important that mentors continue to be reliable and consistent throughout this second stage. 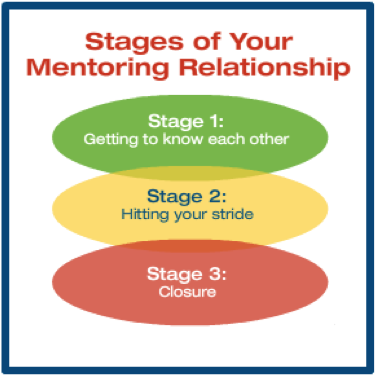 Closure is a natural part of the mentoring relationship and therefore must be part of the planning. It is just as important a step in mentoring relationships as the relationship initiation, and it’s crucial to differentiate between ‘planned closure’ from ‘early closure’. Planned closure is in place from the early program stages and enables a healthy resolution for mentees and mentors; early closure is the unforeseen dissolution of the relationship. Please see the Program & Meetings section for suggestions and strategies for planning healthy relationship closure in your program.